This post was written by Gary Fields, Senior Manager for Content, Lutheran World Relief. Prossy Namutebi is a young woman entrepreneur who runs a farm supply store in the village of Butenga, in southwestern Uganda. On this day, in her role as an agricultural extension agent, she is crouching with Evarista Namujuzi and her husband John Bosco Wamala as they sort maize and discuss post-harvest care of their crop. When they finish, she flips to her saleswoman role, talking about their next planting cycle. She tells them they should consider the brand of pesticide she has brought. It will combat the Armyworm, a pest that drills into maize and decimates the plant as it grows. Prossy is part of a cadre of young people with the Youth Sustainable Enterprises for Equitable Development project, sponsored by Lutheran World Relief in Uganda. Known as the Youth SEED Project, the program stations the extension agents in communities throughout the Masaka region, where they visit farmers and advise them how to get better yields. They also received small business management training so they could run agriculture supply shops that support their work as extension agents. Farming is just one facet of what the extension agents do. They are responsible for helping their farmers find favorable prices and financing. It is a symbiotic relationship. 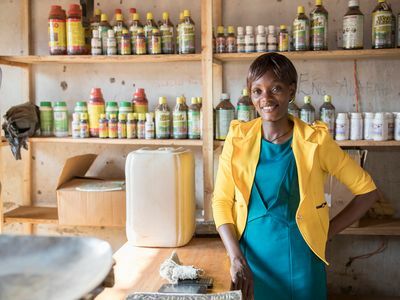 If the farmers are successful, then entrepreneurs like Prossy will have successful businesses and be stationed long term in their communities, long after Lutheran World Relief is gone. In a country where 70 percent of the population is 30 or younger and few of them want to work in agriculture, crop production and attracting young people to agriculture are critical. John and Evarista have worked with Prossy for over a year. They are two of the 180 farmers she sells to and counsels in crop production. The couple have been married 25 years and farmed for years, but said they were only sustenance farmers, despite having a total of seven acres. In a good year they produced enough maize, coffee and other crops to get by. But that changed after Prossy arrived in 2017, John says. She convinced the couple their goal should be to approach farming as a family business. He said he had some knowledge before he met Prossy, but she introduced him to the proper application of fertilizer and pesticides and also how to plant at the right time. The proper fertilizer was key for him because it retained moisture in ways that other fertilizers had not. 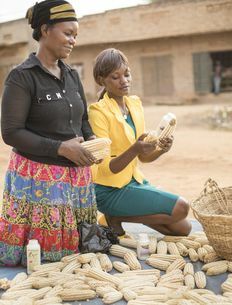 In the first year after the couple began working with the young entrepreneur, their maize production rose from 1,100 pounds per acre to nearly 1,700 pounds. Evarista says that increase in yield means the family’s income went from about 400,000 Ugandan shillings ($110) each year to about 1.5 million Ugandan shillings, about $410, a big difference for a family with nine children and six grandchildren. The children, she says, are attending better schools and the family is eating well and living healthier. Prossy is vibrant and energetic, two reasons fellow farmers chose her to participate in the project. She is a promising farmer with good communication skills, and she is trustworthy. The mother of a two-year-old son, she works constantly. After spending time with the couple, she returns to her shop. It is the off-season, but she calls out to passersby. She recommends they buy the blue tarps she is stocking. They are recommended for drying crops because it helps them retain their quality and purity. It is her big seller this time of year. Some farmers talk with her about soil preparation and what the weather forecast looks like the upcoming season. Prossy says the combination of being an extension agent and a farmer has taken her income from 800,000 Ugandan shillings annually ($220) to about 1.7 million Ugandan shillings ($467) a year. She adds that the business potential is exciting, and her business plan is to expand and become a fixture in the community. How can village agents provide cost-effective access to quality maize to farmers who often live off poor roads in remote locations that are not easily accessible? Learn how a dairy and livestock farmers’ cooperative is transforming local rural economic opportunities in Uganda.